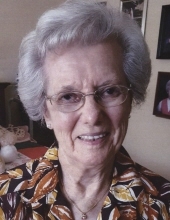 Helen S. Fleck, age 94, of Huntingburg, passed away at 11:40 p.m., Monday, March 25, 2019, at St. Charles Health Campus in Jasper. She was born February 23, 1925, in Schnellville, Indiana, to Joseph and Leona (Morgenroth) Stratman; and married Aloysius Fleck on June 7, 1947, at Sacred Heart Catholic Church in Schnellville. Helen was a homemaker; an exceptional cook; enjoyed gardening, creating quilt blocks and cross-stitching; and loved spending time with her family. She was a member of St. Mary’s Catholic Church in Huntingburg and St. Mary’s Ladies Sodality. She was preceded in death by her husband, Aloysius Fleck, who passed away April 29, 1993; and four brothers, Arnold, Robert, Herbert and Joseph Stratman. Helen is survived by her son and daughter-in-law, Larry (Andrea) Fleck of Indianapolis, Ind. ; one brother, Harold (Cindy) Stratman of Brownsburg, Ind. ; one sister, Mary Ann Bromm Felker of Elgin, Illinois; (4) grandchildren, Dora (David) Hughey, Alex (Kacie) Fleck, Nathan (Amanda) Fleck and Gabriel (Erin) Fleck; and (11) great-grandchildren. A funeral Mass of Christian Burial for Helen S. Fleck will be held at 10:00 a.m., E.S.T., on Friday, March 29, 2019, at St. Mary’s Catholic Church in Huntingburg with burial to follow at St. Mary’s Cemetery. A parish rosary prayer vigil will be held at 3:00 p.m., Thursday, at the funeral home. "Email Address" would like to share the life celebration of Helen S. Fleck. Click on the "link" to go to share a favorite memory or leave a condolence message for the family.